Tripping hazards create opportunities for pedestrians to incur injuries. Building owners can face serious liabilities from walkways containing tripping hazards. Tripping hazards generally develop from uneven concrete settlement and can be a major liability. In most cases, EFT can lift the concrete walkway to effectively treat the uneven concrete slabs. Slabjacking can effectively correct concrete walkways and sidewalks to help correct problems with the Americans with Disability Act (ADA). 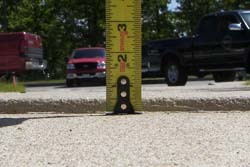 Tripping hazards and uneven walkways can be found at schools, universities, hospitals, apartment complexes, sidewalks and any properties with concrete walkways. EFT helps provides cost-effective solutions to reduce the liability associated with accidents resulting from tripping and falling incidents. Owners, Property Managers, and Municipalities all benefit from slabjacking technology. In most cases, tripping hazards can be eliminated in just a few hours.